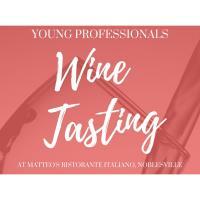 Join us at Matteo's on the square in Noblesville for a Wine Tasting event with their private label cabernet sauvignon, as well as their private label chardonnay and an Italian wine with bruschetta and pizza margherita as appetizers. John Robbins, from Hamilton County Leadership Acadamy (HCLA), will discuss HCLA and his professional journey and why it is an exciting time to be a young professional in Hamilton County. There will be Q & A and networking.